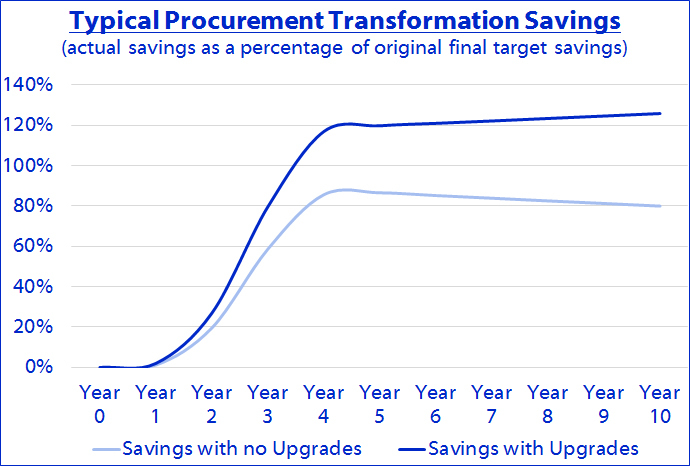 Why should we implement a procurement transformation effort when all we really want is sourcing savings? If you are working in the procurement space and have not already built out a strong strategic sourcing team, you may be concentrating exclusively in this area. We agree that this focus will provide the greatest near term value for your organization. However, driving strategic sourcing without cleaning up your processes, systems and organization will not deliver your maximum variable cost savings and will increase your fixed costs. Organizations that are just beginning to move from tactical to strategic procurement will reduce their variable costs significantly. We have seen typical spend reductions of 4 to 9 percent and savings as high as 18 percent for in some cases. Unfortunately, the savings do not reach expected levels and degrade rapidly when no process, systems or organization improvements are included in support of the strategic sourcing effort. Fortunately, the enhancements needed to achieve your maximum savings can be clearly justified on a stand-alone basis, separate from that of your sourcing efforts.